Former Macleans College student, Chelsea Aitken (2011 – 2015) and House Captain of Batten was one of two University of Canterbury (UC) students who won the Dream Believe Succeed Big Break award in April. The award recognises the potential of their impressive new venture, New Zealand and Beyond. 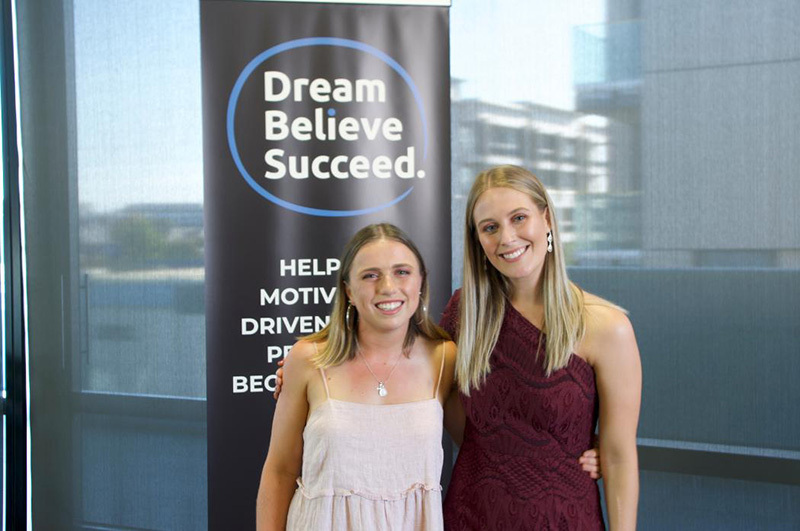 Chelsea and her business partner Millie Morgan, as UC Centre for Entrepreneurship (UCE) students and founders of New Zealand and Beyond, were awarded the sought-after Dream Believe Succeed Big Break Award. The Dream Believe Succeed Foundation awards one Big Break each year. The aim of the award is to enable motivated and determined young entrepreneurs to grow into future business leaders. The prize includes $20,000 cash, plus a plethora of services and support, including accountancy, legal advice, a branding and marketing package, office space, insurance and expert mentoring. The award could not have come at a better time for Chelsea (BCom) and Millie (LLB & BA). Both are in their final year of their study, and had just made the daunting decision to focus on their business rather than apply for graduate jobs. Left: Millie Morgan and Chelsea Aitken. The UC Centre for Entrepreneurship is proud to have played a big part in the development of New Zealand and Beyond over the last year. Chelsea and Millie met on the UCE study tour to Shanghai’s Fudan University. While on the tour, they quickly developed an affinity for China and learnt about marketing, e-commerce, and entrepreneurship from a Chinese perspective. Immersing themselves in Chinese culture helped them understand the huge demand from Chinese consumers for high-quality products from aspirational brands. They saw that many NZ SMEs, with products perfect for this market, were not maximising the opportunity offered by the growing number of image, health and environmentally conscious consumers in South-West China. After returning from China, Chelsea and Millie applied to the UCE EY Summer Startup Programme, a 10-week start-up accelerator. Over the summer they received expert mentorship and connected with a variety of experts from the local business community. This support helped them to develop New Zealand and Beyond from a concept to a fully-fledged startup venture. New Zealand and Beyond offers a service that overcomes the barriers faced by NZ businesses seeking to enter the Chinese market. They provide NZ SME’s lower-risk access to China, by providing an Alibaba e-commerce platform plus marketing and logistics support. New Zealand and Beyond is initially focussing on skincare brands and are in the process of signing contracts with their first clients.